Whilst you might envisage someone who is a professional writer hunched over their computer with paper all over the desk and screwed up sheets of paper in the bin, one definition of prose is simply ‘to put thought onto paper’. If we think of writing in this way, we can all attempt writing tasks. 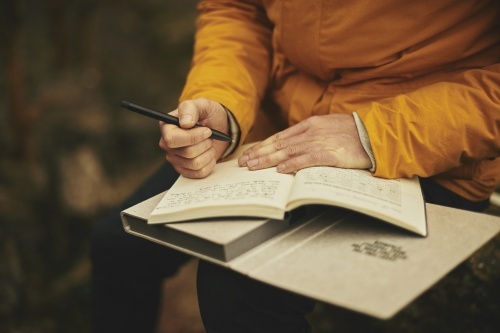 Research has shown that writing benefits people in many different ways from helping to manage their mood, levels of happiness, anxiety, motivation and even their physical health. For example, one study showed that engineers who recently lost their jobs and wrote down their thoughts and feelings about losing their jobs reported feeling less anger and hostility toward their former employer. Eight months later, 52 percent of the engineers in this group were reemployed compared with less than 19 percent of the engineers who were asked to take part in a neutral writing task (i.e. not about their thoughts and feelings related to their former job and employer). Some research shows that people who wrote about achieving future goals and dreams were happier and healthier. Another interesting finding was that when people were writing about how their stressful fundraising jobs made a difference to others, it increased their hourly effort by 29 percent over the next two weeks. Some studies show that people who keep a gratitude diary (reflecting on and writing down the good things in their life) were more positive and motivated about their current situations and their futures. Adults and children keeping a gratitude diary experienced benefits including better sleep, fewer symptoms of illness, and more happiness. So why is writing our thoughts and feelings helpful? Research shows that translating thoughts into concrete language—whether oral or written—has advantages over just thinking the thoughts: It makes you more aware of them, it allows you to see the meaning of events going on around you and create meaning in your own life. This deepens the emotional impact. Make time to write rather than rushing this task, perhaps sitting by the sea, in the garden, in a park or on The South Downs given the wonderful light we have in the month of June. Make a conscious decision to become happier and more grateful as this increases your motivation to achieve this. Write about one thing in depth, elaborating on the detail, rather than writing a list as this approach carries more benefits. Focus on people to whom you are grateful as this has more impact than focussing on things for which you are grateful. Focus on writing words that describe your feelings such as ‘I felt a huge sense of delight as she made me laugh out loud or I felt so excited when she complimented my plan. An effective way of encouraging gratitude is to reflect on what your life would be like without certain good people/things rather than just counting all the good things. Appreciate unexpected events or surprises as these tend to prompt stronger levels of gratitude. Writing occasionally (once or twice per week) is more beneficial than writing in a gratitude diary every day so it is better not to overdo it. Perhaps you might want to share one positive aspect of your gratitude diary with the team at the publication. If so, you could send it to Joan at the following email address: info@thinkingcommunity.co.uk. In the meantime, have a really joyful June in glorious Sussex.